The ultimate migration safari, this fantastic package takes visitors to two unique locations – the Masai Mara and the Serengeti. This migration adventure begins in Nairobi, with a transfer to the Masai Mara for three nights at Mara Bushtops, followed by three nights at Serengeti Bushtops. 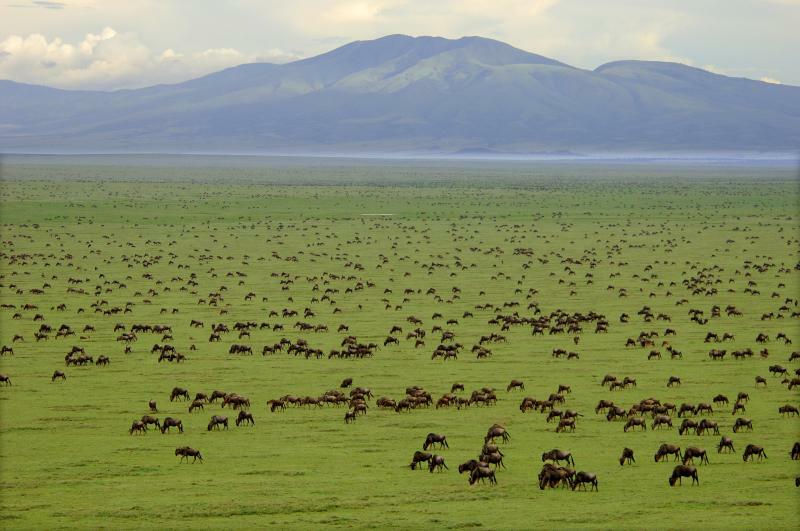 Spend a week or 5-star luxury in one of the most beautiful and unspoiled natural landscapes in the world, with the great migration forming the backdrop for an incredible holiday in East Africa. East Africa is one of the few places in Africa where wildlife takes the main stage, with minimal tourist numbers. Mara Bushtops’ location on the plains of the Masai Mara positions it with unmatched views from the camp’s main areas and private decks. Watch animals congregate from the loungers on your private deck or comfort of the tents’ beds, and enjoy 5-star gourmet meals from the camp’s accomplished chefs. Mara Bushtops is located in the 6000 hectare Mara Siana Wildlife Conservancy in Kenya and guides take guests into the Masai Mara on game drives. The camp is only a short distance from the Mara river where the great wildebeest migration puts up one of its most dramatic scenes during the river crossing. Daily morning and afternoon game drives with excellent rangers, as well as spotlit night drives, take guests across the beautiful plains and their stock of fascinating animals. The vast plains host the famous migration of wildebeest, as well as plenty of predators, gazelle, hippo, giraffe and much more. 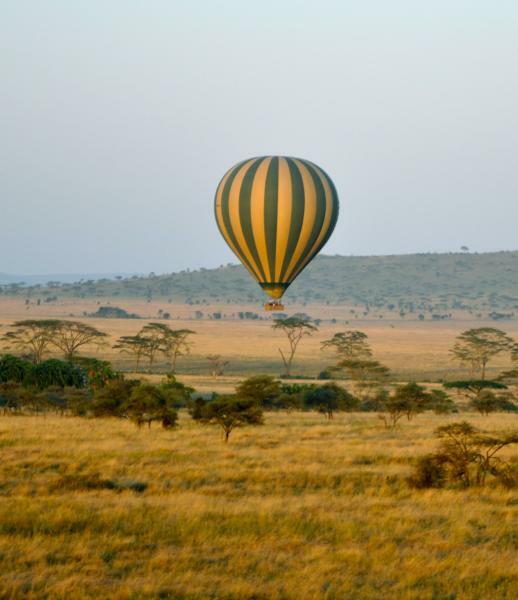 Take the opportunity to look out onto the Mara from a hot air balloon. Tents at Mara Bushtops blend rustic, natural bush camp with minimalist luxury, boasting huge decks with loungers, hot tubs, indoor and outdoor showers, and butler service. Tents open on three sides for maximum exposure to the plains and its incomparable views. The camp is solar-powered, making it eco-friendly. Resting in the rolling hills, with direct views onto the great migration, Serengeti Bushtops is the perfect complement to Mara Bushtops. Take daily drives with knowledgeable trackers, discovering the vast numbers of predators and other mammals that reside and migrate through the Serengeti’s sprawling plains. 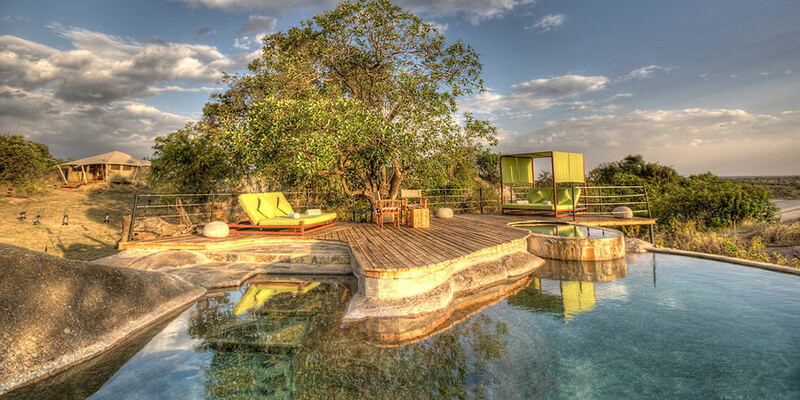 Serengeti Bushtops is a haven for true safari seekers with this ultimate luxury tented camp. It is situated in a secluded part of the northern Serengeti in Tanzania in a private location only 25 kilometers from the Mara River which is directly on the path of the main migration route. This camp follows the same minimalist luxury of Mara Bushtops, with personal butlers, panoramic views, hot tubs, large wooden decks, and WiFi. Another beautiful blend of a luxury hotel with an authentic bush camp atmosphere, without having to relinquish contact with the outside world. As with Mara Bushtops, all meals are included, and bush dining is a special treat. Rotating menus, delicious breakfast buffets and 3-course lunches will ensure you never go hungry. Spend evenings around the campfire sharing safari stories. Complimentary massages can also be enjoyed in the privacy of guests’ tents.